A 2014 paper in the journal Water Research sheds new light on a novel ‘in place’ treatment option that effectively lowers risk by reducing the activity of PCBs in sediment. 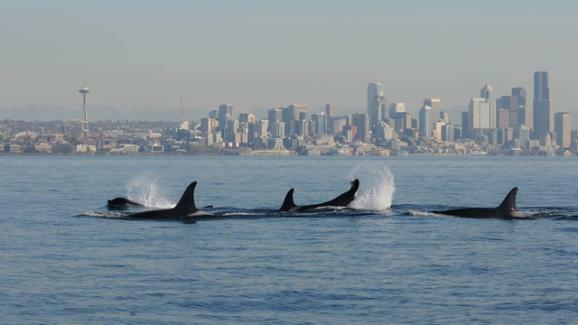 PCBs are leading culprits in the decline of Southern Resident Killer Whales in Puget Sound. Photo courtesy of NOAA. Polychlorinated Biphenyls (PCBs) were banned in the 1970s, but continue to persist in sediments at the bottom of Puget Sound. A vestige of earlier use and improper disposal, they remain among the most toxic pollutants in local waters. In recent years they have been implicated in the decline of the region’s endangered Southern Resident Killer Whale population, and have been at the heart of the current debate about fish consumption rates in the Pacific Northwest. Cleaning up PCB-contaminated sediments such as those found in the Duwamish Waterway in Seattle is an expensive and often contentious issue. Traditional dredging and capping operation may not reduce the risk from PCBs to levels required by law or acceptable to the local communities. bacteria indigenous to sediments. Water Research. http://dx.doi.org/10.1016/j.watres.2013.12.030. Read more about the impacts of PCBs on Puget Sound.